55 CYG (55 Cygni). 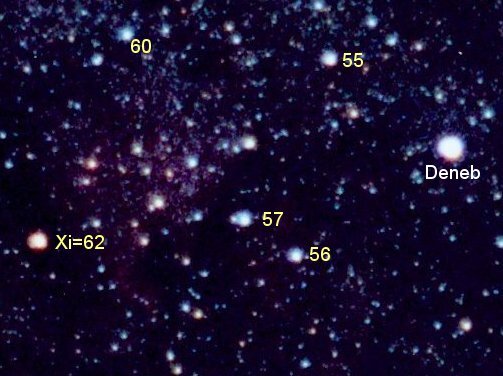 Nearly lost in the Milky Way of northern Cygnus, overwhelmed by the glory of Deneb, lies a magnificent fifth magnitude (4.84) hot class B (B3) supergiant, 55 Cygni, known best by its Flamsteed number. The star, just 1.5 degrees northwest of Deneb, is ridiculously easy to find. Only 1.5 degrees from the Galactic equator, which marks the central plane of the Galaxy, 55 Cyg is dimmed by nearly two magnitudes by intervening interstellar dust, which also dulls its blue-white sparkle. Were the line of sight clear, 55 would shine at mid third magnitude (perhaps 3.11), and be bright enough that it might even have carried a Greek letter name. It's a part of the Cygnus OB7 association of young stars, which nominally includes Deneb itself. First magnitude Deneb (Alpha Cygni) shines at far right, while fourth magnitude Xi (62) Cygni lies at the far left edge just below center. In between (and closer to Xi) is the faint reddish glow of the North America Nebula, NGC 7000. The luminous blue supergiant 55 Cygni is just up and to the left of Deneb. See the labelled version. The star is so far away that its distance, 2330 light years as derived from parallax, is uncertain by about 12 percent or even more. At that distance, and factoring in the ultraviolet radiation from a surface heated to 16,150 Kelvin, 55 Cygni shines with the light of nearly 85,000 Suns. It's actually more luminous than Deneb. 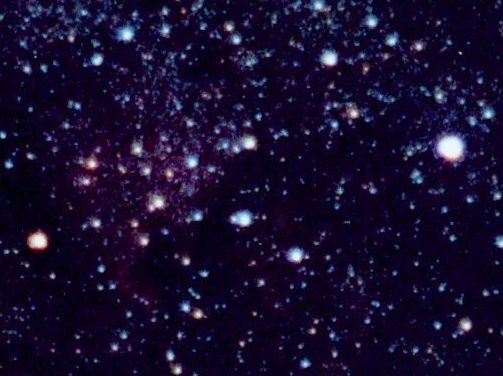 It looks fainter because of its greater distance, the interstellar dust absorption, and because Deneb's light is coming out mostly in the visual spectrum, whereas 55's radiation is shifted more into the invisible ultraviolet. Luminosity and temperature then conspire to give a radius of 37 times that of the Sun, making our blue supergiant nearly half as big as Mercury's orbit. The projected equatorial rotation velocity of 35 kilometers per second yields a rotation period of under 53 days, though without knowing the axial tilt it's impossible to say how far under. Emissions in 55's spectrum tell of a wind that blows at a rate of some 50 million times the solar wind at a maximum speed of about 500 kilometers per second. Not surprisingly, the star jitters by a few hundredths of a magnitude with no discernable period. Theory implies a mass of 17 times that of the Sun, comparable to, or even greater than, Deneb's. Only about ten million years old, 55 Cyg is well beyond the critical mass limit of 8-10 times solar above which stars explode as supernovae. A "companion," eleventh magnitude 55 Cygni B, lies about 20 seconds of arc away, but its motion relative to 55 Cyg proper is far too large, clearly showing it to be yet another line of sight coincidence. Written by Jim Kaler 10/25/13. Return to STARS.